Let’s not pretend this po’boy Conjuring knockoff was ever a sturdy or cinematically inclined franchise. 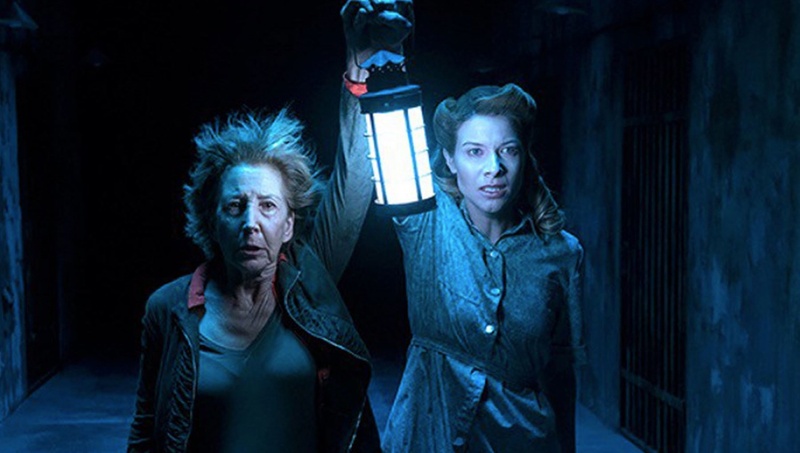 Insidious 4: The Last Key, like so many of it’s fellow horror genre flicks, works backwards through origin stories and prequels. The same rag-tag team of psychic paranormal investigators are on the scene, walking very slowly through doors and turning around even slower when the hear a noise behind them. I’m continually bugged by these films who misinterpret human reactions to fear. Of course, that complaint is silly when you take into account the demon with keys for fingers and the gruesome nightmares these franchises present to their audience. Summoned back to her childhood home on the outskirts of a state penitentiary, renowned Medium Elise Rainier (Shaye) must face the darkness of her past. Back in 1953, in a town (ironically) called Five Keys, New Mexico, a young Elise (Ava Kolker) suffered terribly at the hands of her abusive father due to her gifts. Eventually running away from home and leaving her little brother behind, Elise hasn’t been back since age 16. “My presence tends to draw spirits out of their dark little corners,” she explains to the new property owner. The beings she felt as a child are still present 57 years later. Through this experience Elise will find far more than just spirits haunting the basement, but unlock the mysteries of her tormented youth. Let’s not pretend this po’boy 'Conjuring' knockoff was ever a sturdy or cinematically inclined franchise. Like in previous installments Elise’s ding-dong sidekicks Specs (Whannell) and Tucker (Sampson) provided unnecessary comic relief. However, this time, their prey-like behavior on two young girls throughout the film is almost as bad as the filmmakers frequent closeups of their cleavage. Whannell who is also the creator and writer, alongside “for hire” director Adam Robitel, turn Insidious into tedious. The robotic movement of the actors, slowing down their movement, in that desperate attempt to draw out the suspense is beyond infuriating. They have taken sixty minutes of story and stretched it to ninety by giving Elise lingering minutes to find a key and then slowly bring it towards the keyhole. Between the keys, red doors and whistles there are so many captive women, demon spirits, nieces, that one innocent bathroom break and you will come back to more confusion than when you left. At no point does the script engage the viewer with concern about what really happened in Elise’s childhood, and of course being a prequel, we know she is in zero danger. Why does the monster on the poster have five key fingers, was he the founding father of the town? You get little answers, as usual, only more questions. For audiences looking for scares, there are predictable jump scares, nothing you haven’t seen before. It’s lazy film making, phoned in performances and cheap production value, aimed at viewers with little expectations. “The Further” sequels they produce, the more lackluster this series becomes.